Murmansk on the Kola Peninsula is an increasingly popular choice for Russian and foreign tourists alike. Yes, the fact that Murmansk doesn’t get any daylight for 40 days during the polar night period might at first scare some people away. 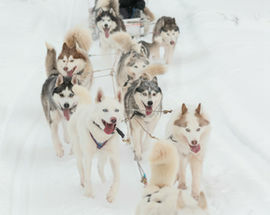 But, in fact, this unique experience attracts many tourists to the world's largest city (population 307,000 people) north of the Arctic Circle. 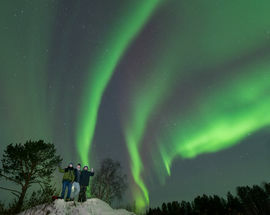 Unlike many other places beyond the Arctic Circle, Murmansk on the Kola Peninsula is an increasingly popular choice for Russian and foreign tourists alike thanks to the great connections from St. Petersburg (1-hour flight, several flights daily) and Moscow (2-hour flight, several flights daily). The city’s infrastructure and decent selection of hotels and restaurants makes it one of the most comfortable city in some of the most uncomfortable weather conditions in the world. 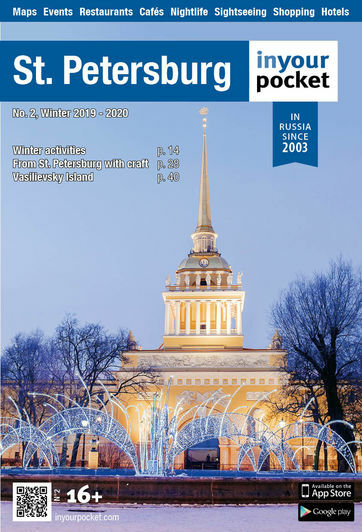 In Your Pocket sat down with Sergey Bolshakov, a Murmansk native and founder of the NordTours tour operator, to find out how to spend the perfect, action-packed winter weekend getaway in and around the city locals affectionately call “Monamourmansk”. The optimal option, according to Sergey, is to get at least 3-4 days in to really make the most of your trip up to the Kola Peninsula. The ideal itinerary to keep tourists fully occupied looks a little something like this. Despite its very recent history (Murmansk celebrated its 100th birthday in 2016), Murmansk has become a strategically important port and a key link in many different transport systems – in short, a city that contributes to Russia in so many different ways. Murmansk was born in harsh conditions. In essence, the city was founded because of the war and for the war. During World War I, Russia was in desperate need of supplies from the Allies: the only solution was to build a port in the Kola Inlet and a railway from here to St. Petersburg. Everything in and around the city will remind you of its naval origins. On the day of your arrival, after settling into your hotel, Sergey recommends spending a few hours discovering the city’s main sites. One of the musts is the gigantic concrete soldier nicknamed Alyosha, erected to commemorate the Arctic fighters who perished in the Great Patriotic War (WWII). Then there’s the 1957 NS Lenin, the world’s first nuclear-powered icebreaker that doubles as an interactive museum. Pay a visit to the gold-domed Church of the Savior on Waters, part of a memorial complex dedicated to the memory of Murmansk's seamen who perished in peacetime. To warm up, head indoors to one of the city’s museums (the Oceanarium, the Museum of the Northern Fleet, the Fine Arts Museum or the Regional Studies Museum). After soaking up the city’s history and culture, it’s time to meet Sergey and Alexander Stepanenko, your experienced photographer/guide and a walking encyclopedia of the Russian North, to embark on the great hunt for the famed yet elusive Aurora Borealis. There are many factors that come into play when embarking on the “hunt”. First and foremost, it’s the weather, which is highly unstable in this part of the world. 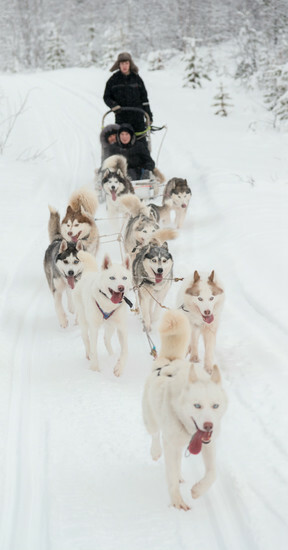 Sergey and his team constantly monitor the conditions and look for the optimal place to take their tourists. This can be anywhere between 30 and 150 kilometers from Murmansk - it all depends on where the skies are clear that night. 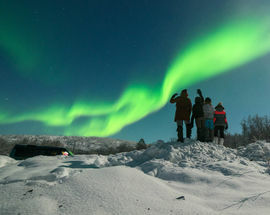 Seeing the Northern Lights in Murmansk is highly unlikely due to light pollution. Once on the road, your tour guides will be on the constant lookout for cloud breaks and will encourage you to do the same. A wide specter of human emotions is revealed during the “hunt”, ranging from worry and anxiety when the skies are covered with clouds, to a childlike joy and fascination once the first beams of light start frolicking in the sky. This is rightfully one of the most popular tours offered by companies like Sergey’s. During his time working as a travel guide on the Kola Peninsula for tourists from all around the world, he’s had Chinese girls jump and kiss him after seeing the lights and seen tears of joy from Japanese tourists who had finally made their longtime dream a reality. But the most memorable and mystical experience that Sergey has so far had was with a family from India. The weather that evening was absolutely not suitable for getting a glimpse of the Northern Lights: there was a blizzard and very thick cloud coverage over the entire Kola Peninsula. 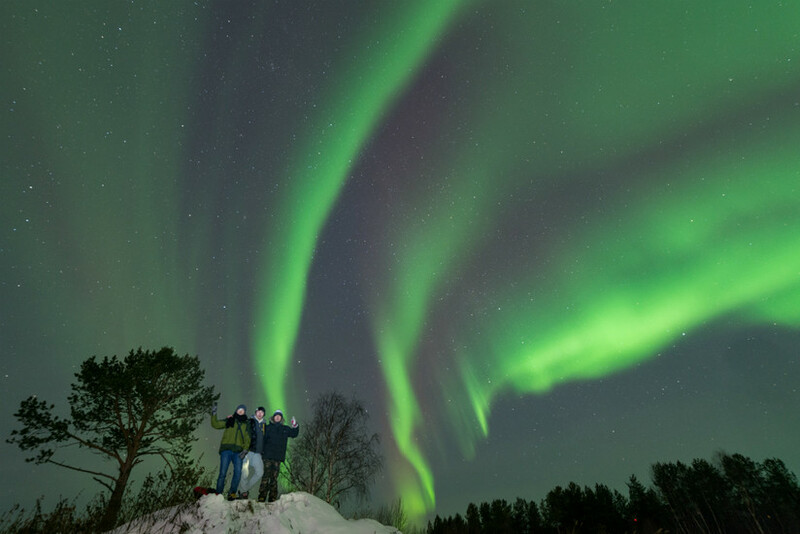 Despite the guide’s insistence that there was zero chance of seeing anything that night, the tourists explained that they didn’t travel thousands of kilometers just to give up. They set off and to everyone’s enormous surprise, for a few seconds the sky opened up and the colorful show delighted everyone, even if for a short time. 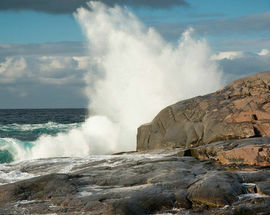 Don’t pass up the opportunity to find out about the way of life of the Kola Peninsula’s indigenous people - the Saami. You can visit a Saami settlement, where locals live a way of life which almost has not changed over the last century. The primary occupation of the Saami is reindeer farming but they are also very skilled fishermen and hunters because they know the Russian tundra like the back of their hand. The Saami possess a rich, unique folklore and many still wear the distinctive and colorful traditional Lappish clothing. 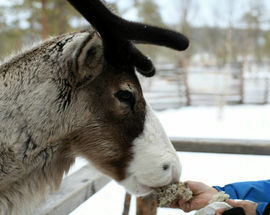 A visit to their village means an up close and personal encounter with their way of life and, of course, their reindeer! 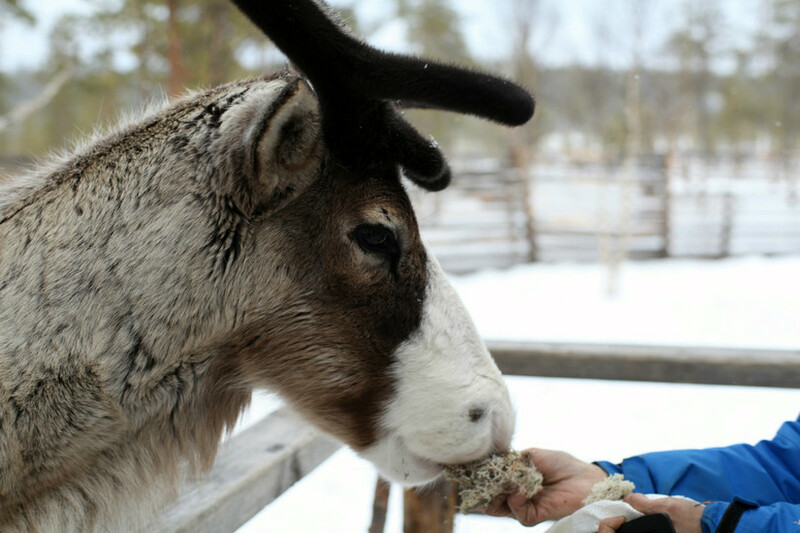 A reindeer herder entertains and educates guests with interesting stories about the past and the present days of the Saami people, their legends and their traditions. Immerse yourself in Saami culture by playing some traditional games, trying your hand at throwing a lasso, taking part in Saami football and, of course, interacting with the reindeer. Perhaps not as traditional but don’t forget to take a couple of goofy selfies with them! A real life Saami shaman (noid) gets visitors around the fire to sing traditional songs, followed by a look at the sacred “seid” (Saami stone) that possesses mystical powers. Before wrapping up the day with traditional teatime and lingonberry pie, you’ll be taken for a ride around the beautiful winter nature on a snowmobile. 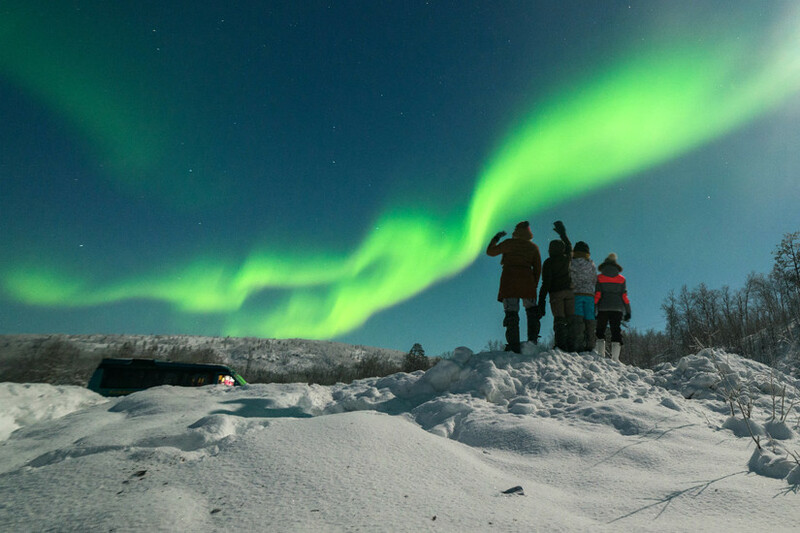 On the way back to Murmansk, keep an eye out for a colorful performance by Aurora Borealis! The movie fans among you will need no explanation of what or where Teriberka is. For those who are not yet familiar with it, some 120km from Murmansk, on the coast of the Arctic Ocean, lies the tiny town of Teriberka. This extremely remote place became famous after the 2014 release of the Oscar nominated film “Leviathan” by famous Russian director Andrey Zvyagintsev. 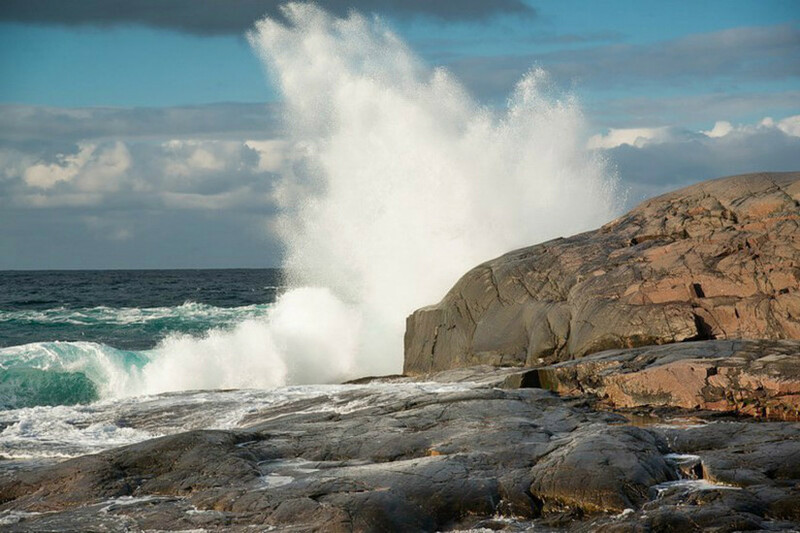 Ever since the movie’s release Teriberka, with its unforgettable scenes of the Arctic coast and breathtaking views of the ocean, has become a very popular tourist destination on the Kola Peninsula. On your way from Murmansk to Teriberka you can try to gauge the vastness of the absolutely treeless tundra and once you reach your destination, you will see the unique northern nature and take a walk along the coast of the Arctic Ocean! Your guides will also take you on a stroll past the various locations where “Leviathan” was filmed, including the infamous cemetery of old wooden ships from the past century. And, of course, keep your eyes peeled for the Northern Lights while in Teriberka because those colorful lights over the old wooden ship cemetery is what any photographer’s dreams are made of. Khibiny mountains are the largest mountains of the Kola Peninsula, dating back about 350 million years. These mountains are rich in stones and minerals, many of which can be found nowhere else in the world. At the foot of the mountains there are two cities — Apatity and Kirovsk, and along the western sides of the Khibiny you can see beautiful lake Imandra. A tour to the Khibiny takes up the entire day and is full of beautiful and interesting sights. Once you get there you will have a chance to enjoy the majestic mountain sceneries - including the Aykuayvenchor mountain which translates from Saami as “The Mountain with the Head of Mother of God” - and walk along the shores of Lake Imandra. A light snowmobile excursion to the Khibiny valley is also possible in the winter season. There is also a snow village that is home to a cave with ice figures of characters from beloved cartoons. A visit to the towns of Apatity and Kirovsk is also a must, as well as to the Mineralogy Museum, which has a unique collection of mountain minerals from all over the world! A relative newcomer on the tour operator market, NordTours have been organizing tours for Russians and foreigners around the Kola Peninsula since 2014. NordTours provide topnotch customer service and a multilingual staff ensures that people from far and wide get to fully appreciate all the region has to offer in winter and summer.